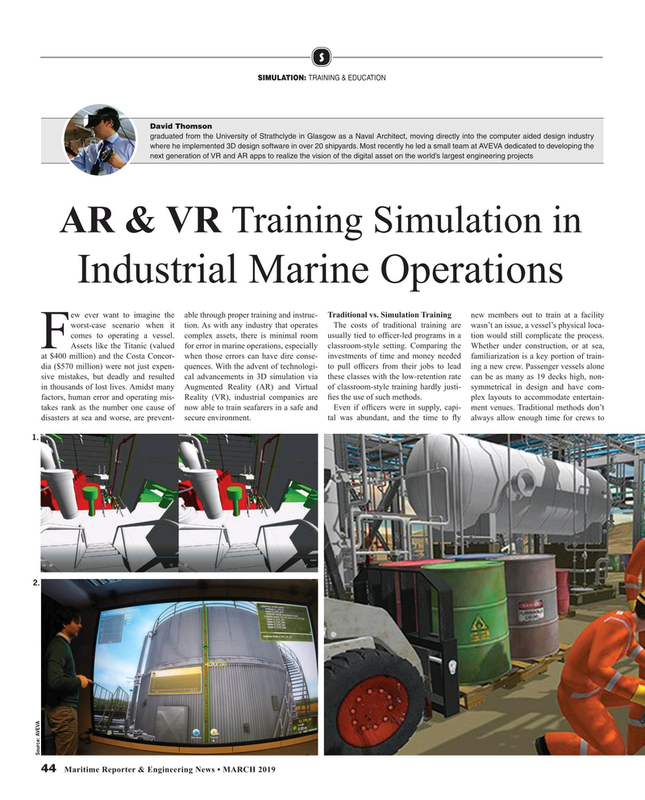 Industrial Marine Operations ew ever want to imagine the able through proper training and instruc- Traditional vs. Simulation Training new members out to train at a facility worst-case scenario when it tion. As with any industry that operates The costs of traditional training are wasn’t an issue, a vessel’s physical loca- comes to operating a vessel. complex assets, there is minimal room usually tied to of? cer-led programs in a tion would still complicate the process. FAssets like the Titanic (valued for error in marine operations, especially classroom-style setting. Comparing the Whether under construction, or at sea, at $400 million) and the Costa Concor- when those errors can have dire conse- investments of time and money needed familiarization is a key portion of train- dia ($570 million) were not just expen- quences. With the advent of technologi- to pull of? cers from their jobs to lead ing a new crew. Passenger vessels alone sive mistakes, but deadly and resulted cal advancements in 3D simulation via these classes with the low-retention rate can be as many as 19 decks high, non- in thousands of lost lives. Amidst many Augmented Reality (AR) and Virtual of classroom-style training hardly justi- symmetrical in design and have com- factors, human error and operating mis- Reality (VR), industrial companies are ? es the use of such methods. plex layouts to accommodate entertain- takes rank as the number one cause of now able to train seafarers in a safe and Even if of? cers were in supply, capi- ment venues. Traditional methods don’t disasters at sea and worse, are prevent- secure environment. tal was abundant, and the time to ? y always allow enough time for crews to 1.